I would say that I’m disappointed in myself for beginning this weblog, throwing a bunch of effort into it, texting my family about it, gaining almost 30 followers, and then taking a month-long hiatus after the first few weeks, but this is pretty commonplace for me when it comes to hobbies. You should see all of the half-finished baby beanies I’ve hoarded in my closets since last year. Truthfully, I’ve been feeling a little funky lately. Something has crept in around my usually exploratory, optimistic, calm soul and surrounded it. I wouldn’t call whatever it is darkness or the blues; it’s more of a long spell of fog– an off-day that has stretched itself over three weeks of my summer. Perhaps the purpose of it is to unsettle me from routine and push me toward the change I’ve been craving. So: I invite it in, and from this day forward I refuse to dwell on it. But to dwell just a little more: I think the fog has something to do with the heat of summer moving over my chilly-weather-loving self. I decided once and for all that I am not a summer person. Admittedly, I love to swim at the pool and I am happiest while swimming in the ocean, but I guess I take advantage of summer sometimes and mostly talk crap about it and wish it would rain. Today is breezy, cool, and absolutely perfect. Moving forward: my family has been basking in the routine-less-ness that the dreaded summer brings with it. The children stayed with their grandparents for a long weekend, and for the first time since our youngest was born, we spent more than one night without them. 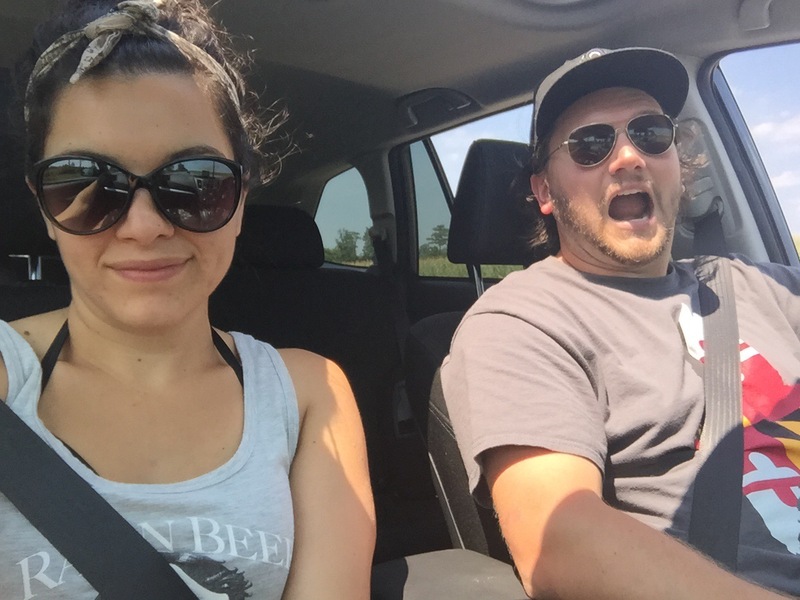 Mostly, my husband and I simply enjoyed the quiet and the freedom from responsibility. We enjoyed simple dinners of fresh lake trout, roasted artichokes, and cheese plates prepared and eaten with forced indolence. We hated to rush the time, and we didn’t want to seem too eager to head to Fells Point (or wherever) for drinks. Like I promised myself I’d explore while bidding Maine a farewell, we strolled around a local fish market–the most famous in Baltimore, actually: Faidley’s. The journey to Faidley’s reminded me of The Hobbit, except instead of a sprawling landscape of mountains, forests, and rivers, we had to trespass Lexington Market. Instead of cave goblins and giant forest spiders, my husband and I had to evade modern-day Baltimorean characters. But our arrival was sweet. 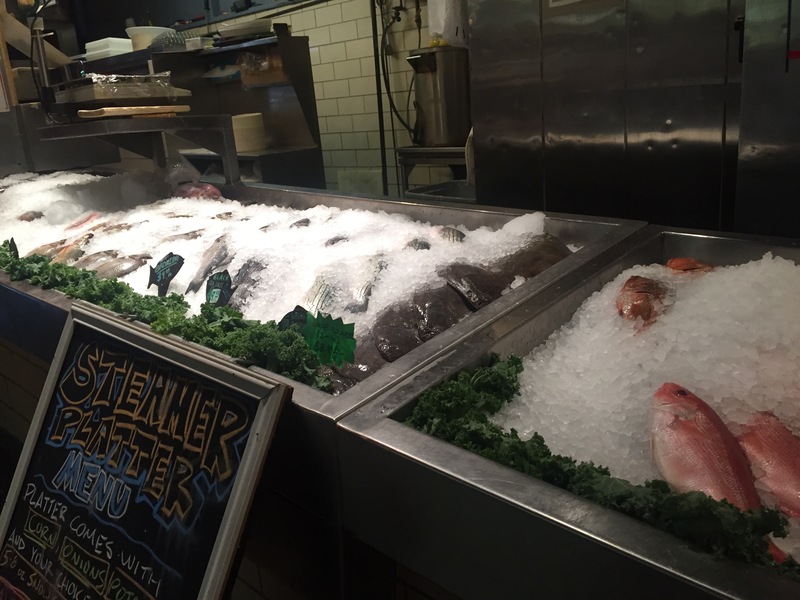 We walked into a cool concrete square of a room and were immediately surrounded by shelves caked with ice and whole fish. 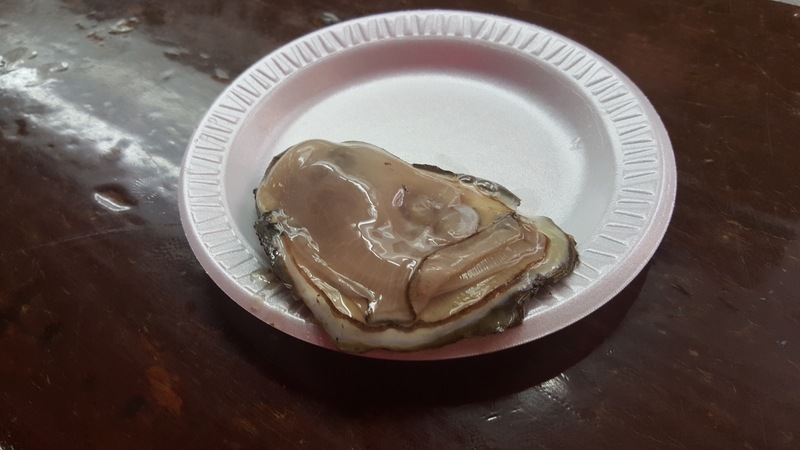 It is exactly what I hoped I would find: steamed crabs, raw blue crabs, red snapper, salmon, tilapia, trout– all shiney-eyed, plump, and caught during the early hours of that morning. I also noticed signs advertising muskrat and raccoon for sale, but I’m just going to hope that was a joke. We each ate two delicious oysters the size of my hand, promised to come hungry for crab cakes during our next visit, and then we bought that trout I mentioned earlier. The next day, we met friends in Ocean City, still blissfully childless, and ate Thrasher’s boardwalk fries and Bridge Mix from Candy Kitchen. We drank tons of beer. I drunkenly discussed astrology with our friend’s mother. It was a wonderful time, and I will always remember it. But let us talk about those kid-free artichokes. Serves 2 to 4…but I’m going to be honest, I could eat them all by myself. If you’re not familiar with cutting up artichokes, the way we do it is cut off the pointy ends of the petals with kitchen scissors. After that, we half each artichoke and use a sharp pairing knife to clear the center of all the fuzzy bristles. Sure, all of those floral-looking purple leaves are pretty, but most of them have to go. Just make sure there are no traces of prickly insides left. 1) Preheat oven to 375° F, line a cookie sheet with parchment paper. 2) On a cutting board or plate, pour oil over each artichoke half, dividing the tablespoons evenly between the 8 pieces, and rub it all around the inside with your fingertips. Drizzle each half with balsamic vinegar, and then sprinkle with salt and pepper. 3) On the parchment paper, cluster garlic slices into eight groups spaced 3 inches apart. 4) Lay artichoke halves face-down over each garlic cluster. 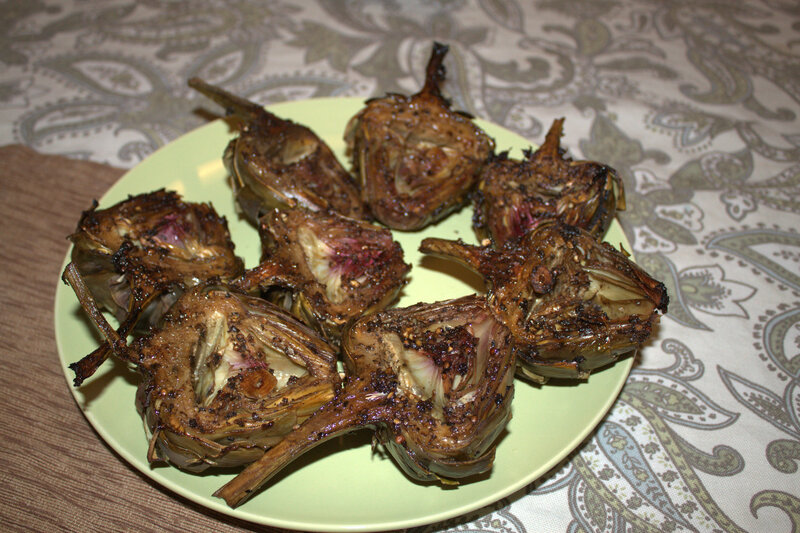 My husband likes to slip the garlic slices into the artichoke’s petals, and it is delicious if you feel like taking that extra step. 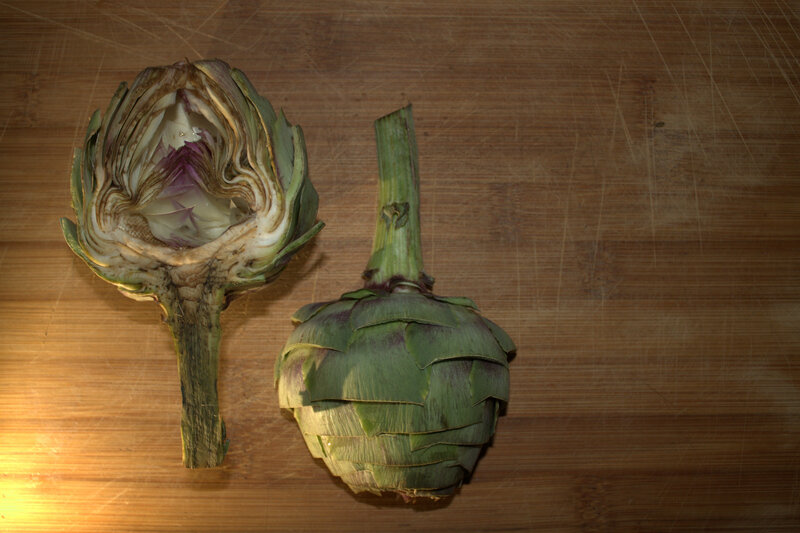 5) Roast for 40-45 minutes or until the heart of the artichoke is easily pierced with a fork. Let them cool for a few minutes before indulging.